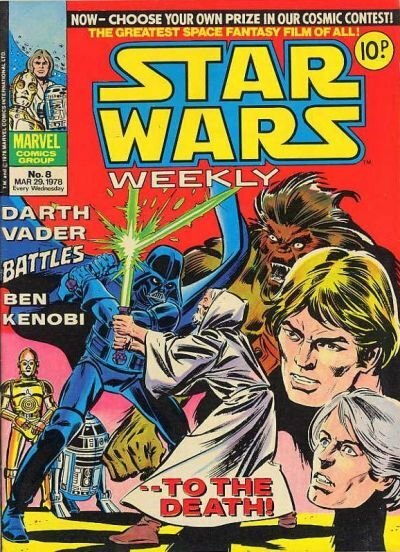 Click Here To See Star Wars Weekly #8 Comic Book! Check out this very nice 1978 Star Wars cover prelim, which actually reprinted the interior story from Marvel's STAR WARS #4! This great all-out battle cover was penciled and inked by the great Gil Kane, from the story titled: "In Battle with Darth Vader!" 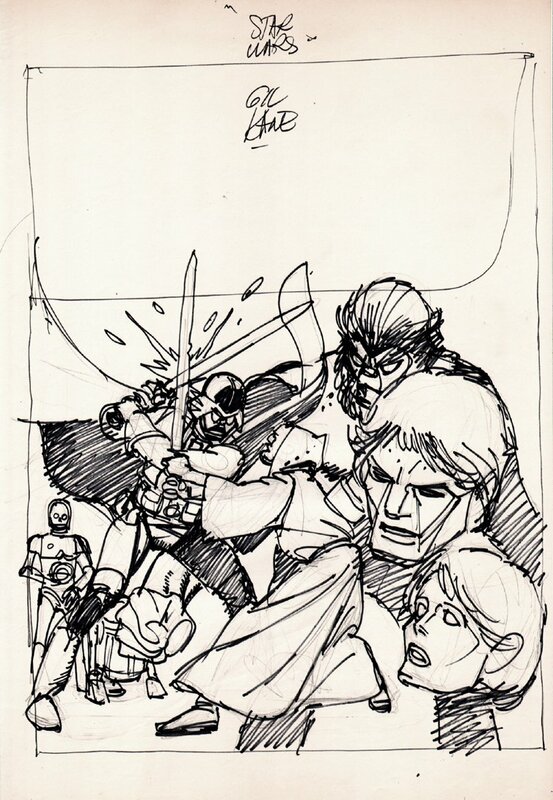 This nice cover prelim is drawn on an 11 by 17 inch art paper, and was drawn just 5 months after the original Star Wars #4 comic book for Marvel Comics hit the news stands in October of 1977! This cover is similar to the published Star Wars #4 comic book in that it features Obi-Wan Kenobi in mortal combat with Darth Vader aboard the Death Star I! Luke Skywalker, Han Solo, Chewbacca, and the droids: R2-D2 and C-3PO! In the story this cover is for.... Darth Vader and Obi-Wan Kenobi engage in a light saber duel. Vader strikes Kenobi down in the duel, but in the confusion Luke, Leia, Han, and the rest of the group make good their escape from the Death Star aboard the Falcon! Just a GREAT, "SIGNED" CLASSIC Cover prelim to own, without paying a published cover price, while still showing off Gil Kane's incredible, pure, untouched pencils AND INKS, just before he created the published cover for publication! Compare this nice cover art to the published comic book in the red link above!